Fruit of pomegranate split open showing the juicy seeds on the inside. The pomegranate, botanical name Punica granatum, is a fruit-bearing deciduous shrub or small tree] that grows between 5 and 8 m (16 and 26 ft) tall. Although previously placed in its own family Punicaceae, recent phylogenetic studies have shown that Punica belongs in the family Lythraceae, and it is classified in that family by the Angiosperm Phylogeny Group. The name pomegranate comes from medieval Latin pōmum "apple" and grānātum "seeded". Punica granatum, the scientific name of the pomegranate, was given by Carolus Linnaeus in 1753 in Species Plantarum (Vol. 1, page 472). Punica comes from the Latin name for the pomegranate, malum punicum, meaning "apple from Carthage", and granatum from medieval Latin meaning "seeded", "with seeds". The pomegranate is a shrub or small tree that could grow up to 6 to 10 m (20 to 33 ft) high with many branches with spines. Leaves are opposite 3–7 cm (1.2–2.8 in) long and 2 cm (0.79 in) cm broad. The flowers are yellow to bright red and 3 cm (1.2 in) in diameter, with three to seven petals. Fruits are berries with a strong skin, like leather, intermediate in size between a lemon and a grapefruit, 5–12 cm (2.0–4.7 in) in diameter.. Fruits have many seeds with fleshy and edible coats (called sacrotesta). The number of seeds in a pomegranate can vary from 200 to about 1400. P. granatum var. nana is a dwarf variety of P. granatum popularly planted as an ornamental plant in gardens and larger containers, and used as a bonsai specimen tree. The pomegranate originated in the region of modern-day Iran, and has been cultivated since ancient times throughout the Mediterranean region and northern India. It was brought into America in the late 16th century, including California, by Spanish settlers. Today, it is widely cultivated throughout the Middle East and Caucasus region, north and tropical Africa, the Indian subcontinent, Central Asia, the drier parts of southeast Asia, and parts of the Mediterranean Basin. It is also cultivated in parts of Arizona and California. ↑ "Punica granatum L., The Plant List, Version 1.1". Royal Botanic Gardens, Kew and Missouri Botanical Garden. 2013. Retrieved 8 January 2017. ↑ Harper, Douglas (2015). "Etymology of pomegranate". Online Etymology Dictionary. Retrieved 8 January 2017. ↑ Harper, Douglas (2015). "Etymology of grenade". Online Etymology Dictionary. Retrieved 8 January 2017. ↑ "Taxon: Punica granatum L." U.S. National Plant Germplasm System (NPGS/GRIN). Retrieved 8 January 2017. ↑ Carolus Linnaeus. "Species Plantarum, Tomus I" (in Latin). p. 472. Retrieved 8 January 2017. ↑ 6.0 6.1 6.2 6.3 6.4 6.5 Morton JF (1987). "Pomegranate, Punica granatum L." Fruits of Warm Climates. Purdue New Crops Profile. pp. 352–5. Retrieved 8 January 2017. ↑ "Does a larger pomegranate yield more seeds?". AquaPhoenix. Retrieved 8 January 2017. ↑ "Pomegranate. California Rare Fruit Growers". Crfg.org. Retrieved 8 January 2017. 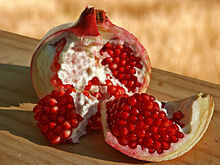 Wikimedia Commons has media related to Pomegranate. Wikispecies has information on: Pomegranate. This page was last changed on 23 April 2018, at 14:03.